Coping with terrorism and racism is tough for adults. For college students, it’s tougher. 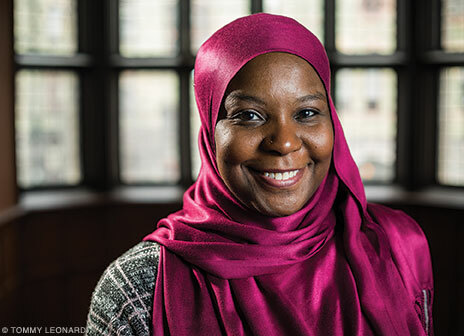 And for Muslim students, it’s almost impossible, says Kameelah Rashad C’00 GEd ’01, Penn’s Islamic chaplain and an advisor to the Muslim Student Association (MSA). Though college is an opportunity for many young adults to figure out who they are and what they might become, Muslim students are being told, by some politicians and segments of the media, that they are violent, misogynistic, and not American. Due to their visibility, women who wear hijab often bear the brunt of that scrutiny. Du’aa Moharram, a freshman in the Nursing School, is one of them. “Some days, I pray to God to get me to my dorm safely,” she says, confiding that people on the street stare at her with suspicion that sometimes deepens into open contempt. Two young men shouted “ISIS” at her on campus. And on the train to Penn after winter break, Moharram says, a man stared at her with such hatred that she feared for her safety. Being the object of fear can be a new experience for international students who come to Penn from Muslim-majority countries where Islamophobia doesn’t exist. “One student from Afghanistan told me that he didn’t know that in the US, you’d be looked at with suspicion just because you are brown, have a certain name, or wear a beard,” Rashad says. For students who feel isolated by the hatred and intolerance around them, the MSA is one shelter in the storm; Elsawah and Moharram say that they have family-like bonds with their MSA friends. Rashad says that other religious leaders on campus, including Penn Hillel president Katie Hartman, a College junior, have voiced support for Penn’s Muslim community, as have President Amy Gutmann and Provost Vincent Price. Of course, “How are you feeling?” is typically a well-intentioned question. So is “Where are you from?”—a query that nonetheless impels Moharram to go into a detailed, defensive explanation of her ancestry, when the simple answer is: New Jersey. Moharram and Elsawah share that desire. I have so much sympathy for people who are experiencing discrimination and intolerance, and as a Penn employee I am shocked to hear of details of intolerant incidents. The United States was created as a haven for all manner of religious expression, and hijab is part of a cultural and religious expression that needs to be accepted; any other reaction is intolerance and hate. Many Americans are Muslims, they contribute to our diverse culture as do any and all other groups! Let’s truly make American great again by embracing all our citizens. Thank you for the inspiring message conveyed with both empathy and compassion towards Muslims and non-Muslims alike. All too often American society advocates violence as an expression of power in conflict resolution as a means of suppressing perspectives that oppose and challenge the status quo. Concomitant with such is the need to exterminate an existential threat of the psychological other–people from non-Northern European Protestant Christian cultures. It’s important to point out to so-called progressives and others who readily claim “colorblindness” they cannot remake others to fit their narrow cultural ideal or construct simply because we’re inundated with messages to assimilate into a thoroughly homogenized “American” culture. The new narrative is to realize that you are living in America where everyone speaks English and where you are not required to wear scarves on yourr heads. Why continue such old ways from the old country? No wonder you are being singled out. I asked 4 muslim women at an affair on Saturday if they ever considered letting the scarves go. They were so shocked by the question. Two said their husbands wouldn’t allow this. Why are they here, then? Why do people join up with them?